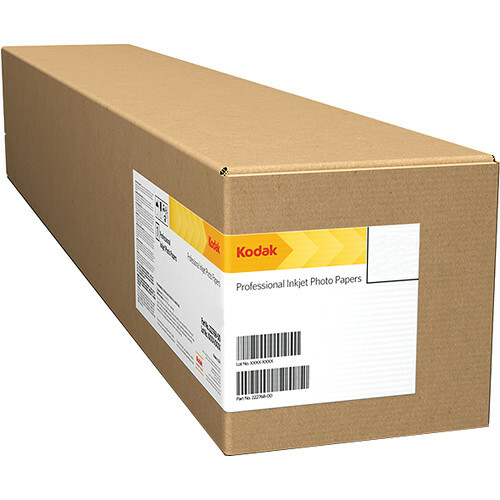 The 44" x 100' roll of Professional Metallic Photo Inkjet Paper from Kodak is a 255 g/m2 allows users to produce metallic prints previously only available in a traditional darkroom. The metallic, high gloss finish duplicates the characteristics of Kodak Endura Metallic Paper. Professional Metallic Photo has a larger color gamut and higher Dmax to ensure that the color captured in-camera reproduces more accurately, while producing deeper, richer blacks, an expanded dynamic range, and additional detail in shadow areas. The paper is compatible with dye and pigment-based photo inkjet printers. Box Dimensions (LxWxH) 44.0 x 6.0 x 5.5"